In the UK, thousands of people die every year because they cannotÂ afford to heat their homes. 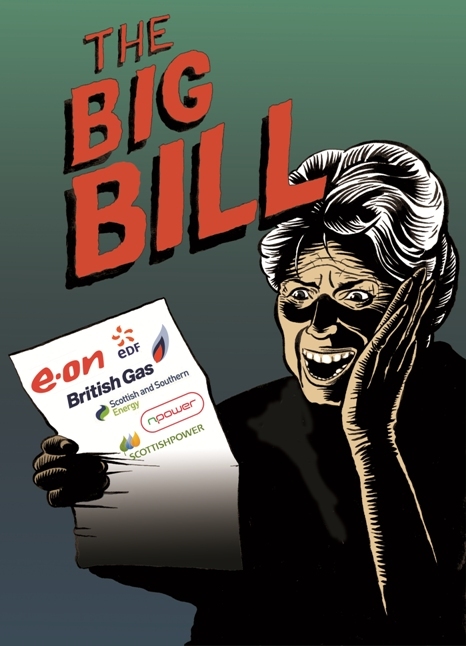 Whilst wholesale oil and gas pricesÂ have fallen, the UKâ€™s Big 6 energy companies have hiked prices,Â meaning five-year record high profits for them and cold homes forÂ us. The government is letting its corporate allies rake in billionsÂ from leaving societyâ€™s most vulnerable people to freeze,Â including pensioners, babies, and people who are ill or disabled. These same energy companies are also relentlessly investing inÂ fossil fuels at the cost of countless lives through climateÂ change and pollution. On Tuesday 22nd November, the government will announce its excessÂ winter death statistics for 2010-2011,Â which will reveal theÂ extra deaths last winter in comparison to other seasons. On thisÂ day, join Fuel Poverty Action in a â€˜die-inâ€™ to expose theÂ collusion of the Big Six and the government in leaving people toÂ die in the cold. We will meet at 10.30, Parliament Square. FromÂ there, we will proceed to a Big Six target and use our cold andÂ â€˜deadâ€™ bodies to disrupt their operations. The Fuel Poverty Action die-in will actively confront theÂ profiteering energy companies and corrupt government whoseÂ actions are killing people through fuel poverty and climateÂ change. In doing so, we will take action against cold homes,Â winter deaths and the destruction of the climate, and take a stepÂ towards the energy system that we need to see, run for peopleâ€™sÂ needs, not private profit.